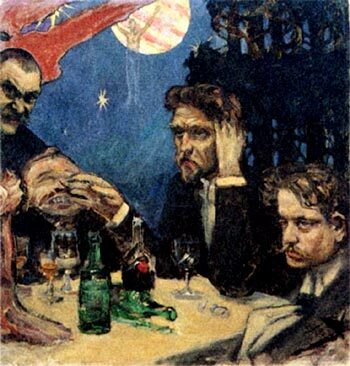 A widely discussed painting by the Finnish artist Akseli Gallen-Kallela, “The Problem,” depicted Sibelius drinking with friends, his eyes rolled back in his head. The other figures in the paintings are (left to right) the painter himself, the composer and critic Oskar Merikanto, the conductor Robert Kajanus, and Sibelius—while the drink on the table is DOM Benedictine. The second work is more carefully executed and less fantastical; but perhaps of most interest in the historical context is that the figures are less wildly drunk than darkly intense and brooding. Where in the first painting Sibelius is pale and wasted, and Gallen-Kallela snarling directly at the viewer, in the second painting the artists are represented as staring intently at the wings of Osiris, lost in philosophical reflection rather than drunken stupor. Gallen-Kallela's eyes are completely sunken into shadow, while Kajanus holds a cigarette that looks like it will burn off in his hand. I wonder whether this was the painter's response to the public controversy over the raw drunkenness depicted in the first painting, which was loud enough to result in Sibelius being refused loans—a painterly revision designed to reveal the real heart of the Symposion evenings superficially depicted in Kajustaflan. More background on Sibelius's so-called "Symposion Years" can be found here.